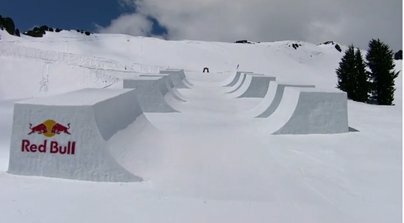 What happens when you take a perfectly good Olympic sized-halfpipe and cut half of it out? The answer is the Red Bull Cubed Pipe. Conceived by Simon Dumont, professional skier and world record holder for highest air on a quarterpipe, the idea was given wings this week after years of planning. What began as a 22-foot tall, 550-foot long halfpipe turned into a series of take-off and landing areas with nothing else in between, lowering the margin of error for Dumont's world famous big airs and tricks to zero. Built by Snow Park Technologies, the &quot;Cubed Pipe&quot; features 10 individual cubes and took over 720 hours to construct. Check out the video below, and stay tuned for more footage in Poor Boyz Productions' new film, The Grand Bizarre.